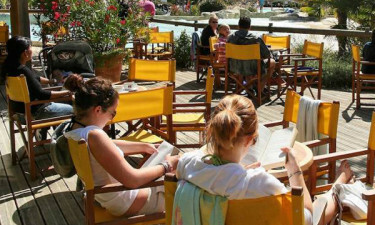 Les Alicourts Resort delivers absolutely everything campers expect from a luxury camping site. 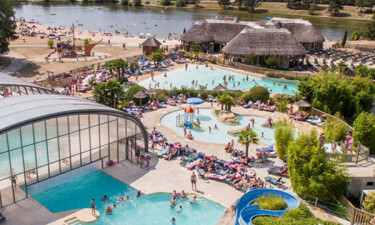 This 5-star holiday camping site in the Loire Valley indulges the holiday spirit and all of the senses with the beauty of its surroundings, its superb facilities and its warm and welcoming atmosphere. LUX-camp will also ensure that campers enjoy a well-fitted and spacious mobile home that accommodates every need. The availability of revitalising hydrotherapy and other wellness facilities. An aquatic park designed for maximum family fun. Superb service from check-in time. A golf course, sports fields and play structures for inclusive family entertainment. Les Allicourts Resort successfully blends luxury camping facilities with sustainable development, which means revelling in the tranquillity of nature, while enjoying every modern facility. Ecological accommodation amid 20 hectares of preserved forest offers the ultimate commune with nature, while a mobile home in a stunningly landscaped setting lets campers appreciate nature’s vibrantly colourful palette. Campers are inherently nature lovers, and, also in the Loire Valley and close to the holiday camping site is the Parc Floral de la Source, which is a UNESCO heritage site. Here visitors can enjoy wandering amidst Asian and tropical gardens with more than 350 animals as company. However, Les Alicourts Resort has enough to keep nature lovers and adventurous spirits more than happy. 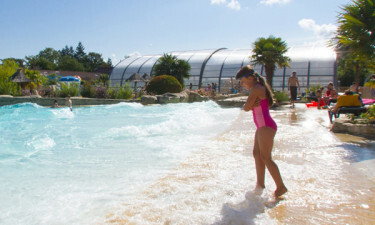 The aquatic park at Les Alicourts Resort exemplifies a luxury camping site. 4 pool areas that include a wave pool, a paddling pool and a heated covered pool provide the type of water activities expected from luxury camping. Water slides offer lots of inclusive family fun, while a spa area takes care of tired muscles and any residual stress. Please note: The pool area is open from the 5th of May to the 2nd of September. A soft sandy beach accommodates sun worshipers who simply want to relax and enjoy the cool water lapping at their toes, while the children build sand castles. For those wanting to expend more energy on their camping holiday there are 6 hectares of lake area on which to ski, canoe or kayak. There is also the option of some fishing for the moderately energetic. 3 excellent luxury camping facilities take care of any hunger pangs that develop throughout the day or evening. Order a take-away meal and enjoy a cocktail on the terrace while waiting for it to arrive. Menus include fresh, crisp salads, pizzas, chips and a selection of fine cooked dishes. Meals enjoyed on the spot can be savoured both indoors and outdoors. Please note: The restaurant and bar is open from the 5th of May to the 2nd of September. Gifts and postcards available at the gift shop takes care of the folks back home, while personal souvenirs are lasting reminders of a superb camping holiday. All other necessities are provided by a well-stocked on-site supermarket, which also ensures that the tantalizing aroma of freshly baked bread and pastries wafts across the morning air. Les Alicourts Resort provides comprehensive camping luxury.